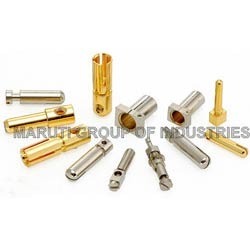 We are a leading Manufacturer of plug pins and sockets from Jamnagar, India. Our organization manufactures, supplies and exports a variegated range of Plug Pins and Sockets. High quality material, which is sourced from certified vendors of market, is used in the manufacturing process of the offered range. Our experts employ advanced technology and latest machines in the manufacturing process following industry set guidelines. Looking for Plug Pins and Sockets ?